Have you ever wondered what the world will look like in the future? Have you speculated about it before and ended up with unrealistic expectations? So have we. The future is ever changing and unpredictable. We don’t casually go for a stroll on Mars with our alien friends. Instead, we catch airplanes and take selfies "on Earth, with humans". And that’s the exciting thing about it. We will never know for sure what the future holds, but we do know that the times are a-changing, and we - inevitably - must adapt. 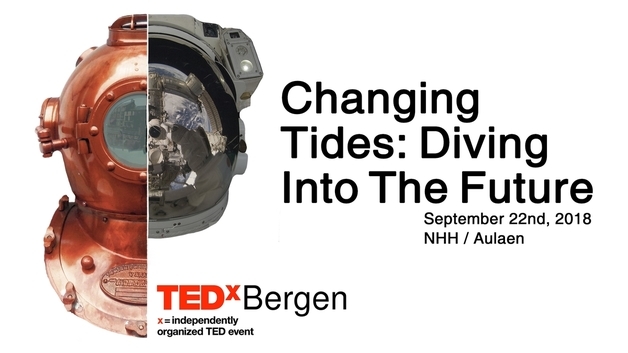 The TEDxBergen 2018 team aims to present a deep and careful evaluation of the unprecedented technological revolution that will - undoubtedly - alter the way we live, work, and communicate with one another. We invite you to dive into the future with us and embark on a journey to discover the disruptive changes that might occur in the years ahead of us.